On the 14 October 1922, the first ever Ulster Grand Prix was held at the Clady Circuit on the outskirts of Belfast. In 1953 the race moved venue to the nearby Dundrod Circuit, which has remained its home ever since. In those early years the popularity and importance of the race grew from strength to strength, with the Ulster GP becoming an annual fixture on the World Championship calendar. However, in 1963 the Ulster Grand Prix stood on the brink of extinction due to acute financial difficulties. This was not the first time that the ‘Ulster’ had faced financial problems. In 1939 a similar crisis had occurred and a small band of enthusiasts had raised the ‘princely’ sum of £200 to ensure the race went ahead that year. This time, the Northern Ireland Tourist Board had withdrawn their financial assistance as they no longer considered the ‘Ulster’ to be a tourist asset to the province. The outlook for the event was extremely bleak. Following the announcement in the spring of 1963, whilst considering what action to take, a race enthusiast, Desmond Jardin contacted the then Secretary of the MCUI – Ulster Centre, R J Hewitt (Bobby) to ask how he could help publicise the crisis facing the race meeting. Bobby replied ‘if you think so much of the ‘Prix’ why don’t you form a Supporters Club’. Des, immediately took up the challenge, and along with his close friend Herbert Ingram, set about organising the first ever meeting of the Ulster Grand Prix Supporters Club. On 11 April 1963, 300 race fans crammed into a hall in Glenavy, Co Antrim for the inaugural meeting. Also in attendance were Reg Armstrong, Stanley Woods and Ernie and Alan Lyons, the top riders of the day. The meeting was a huge success, although the funds generated that night amounted to only £65.00, a far cry from the substantial sum urgently required. 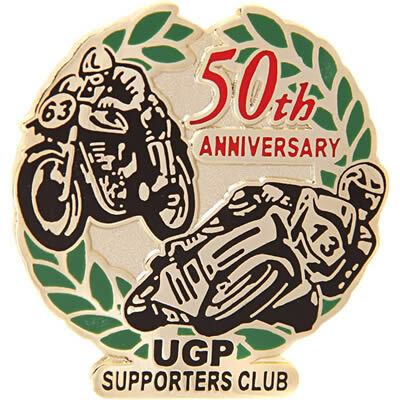 What really saved the day was a decision to produce and sell a metal lapel badge inscribed “UGP 1963”. The demand for this badge outstripped all expectations and was not satisfied until a total of 15,000 were distributed. As a result the club was able to donate £1000 to race funds and the 1963 “Ulster” was rescued. Unfortunately it soon became evident that the precarious financial position of the race was no mere temporary aberration and the Supporters Club discovered that the task it had undertaken was not destined to be a “one off” affair, but one which would make great demands on it year after year after year. Difficult times still lay ahead, especially in the early 1970’s during the worst of the civil unrest in the province and again after the UGP lost its World Championship status in 1973. This in particular, was a severe blow to morale and it took several years for the club to recover from the effects of the FIM decision. The decline in membership was nonetheless reversed and in 1977 the club was in a position to hand over £10,000 to the race organisers. Unfortunately, the level of commercial sponsorship which the event attracts is still nowhere near sufficient to safeguard its future, so the organisers are still heavily dependent on the donation from the supporters club. In recent years the club has benefited from generous donations from past and present club members. One such benefactor was founder member, the late Sammy Glass, from Belfast. Sammy bequeathed a most generous donation to the club, which enabled the committee to purchase the hospitality trailer, which can be seen at Dundrod in the UGPSC area beside the VIP marquee and grandstand. The club also purchased a trophy in his memory and this is awarded to the highest placed newcomer in the second superbike race. There also is a generous cash prize which is awarded along with the Sam Glass Memorial Trophy. Thanks to the amazing generosity and loyalty of our membership we continue to provide substantial financial backing for the event. 2013 will see the club celebrate their 50th Anniversary.